Haldex Concentric has won the contract to design and manufacture the water pump for the new YC6K heavy-duty diesel from Yuchai, China's largest manufacturer of diesel engines for commercial vehicles and one of country's leading exporters. Designed in conjunction with the Austrian powertrain specialists AVL, the engine will be produced in two models, the 12.2 litre Y6K-12 and the 13 litre Y6K-13. To ensure that it matches world class standards, it incorporates advanced technologies such as high-pressure common rail, SCR (selective catalytic reduction) exhaust after-treatment, Jacobs in-cylinder braking (compression release braking), 4-valve overhead camshaft and an integral cylinder head, which is rarely seen in China. The engine also introduces a brand new cooling concept that involves a modular, symmetrical cylinder design in which the cylinder head is cooled first and then the cylinder block. Haldex Concentric employed its bespoke WPD (water pump design) software to design a pump that optimises both efficiency and cavitation performance in line with Yuchai's requirements. 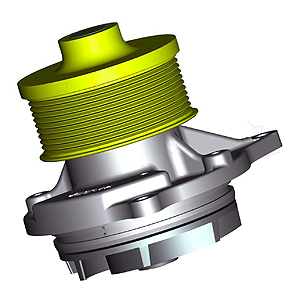 All serviceable parts are contained within a simple plug-in cartridge, reducing overall component count and total life costs for the engine. The pump will be manufactured at Haldex Concentric's plant in Suzhou and the first production quantities will be delivered to the Yuchai plant in Wuhu, Anhui province during 2010. Based on more than 30 patents, Yuchai's YC6K series engines represent an industry breakthrough by successfully combining cooling technology with high strength materials, enabling the engines to meet Euro VI emission requirements while significantly prolonging the engine's lifetime. The new engines have gone through a total of 40,000 hours bench testing and gigameter vehicle road verification. Over the next two to three years, the YC6K's main application will be at Chery heavy-duty trucks. The YC6K engine will be manufactured in Wuhu by a joint venture company formed by Yuchai subsidiary GYMCL, Jirui United and Jiusi. It is designed for use mainly in trucks of 12 metric tons and above, and for passenger coaches exceeding 12 meters in length. In addition to the YC6K diesel engine, GYMCL will also license the JV Company to manufacture the YC6M and YC6L heavy-duty diesel engines under the "Yuchai" logo and trademark. The annual production capacity of the JV Company is estimated to be 50,000 heavy-duty diesel engines gradually increasing to 200,000 units, with GYMCL and CIMC-Chery being the intended customers of all manufactured diesel engines. CIMC-Chery mainly produces medium to heavy-duty freight trucks and parts and will purchase from the JV company YC6M, YC6L and YC6K series engines and parts for use in relevant models. China Yuchai International Limited, through its subsidiary, Guangxi Yuchai Machinery Company Limited ("GYMCL"), manufactures, assembles and sells a wide range of light-duty, medium-sized and heavy-duty diesel engines for construction equipment, trucks, buses, and cars in China. GYMCL also produces diesel power generators, which are primarily used in the construction and mining industries. Founded in 1951, GYMCL has established a valuable brand backed by strong research and development, winning significant market share in China. In 2008, GYMCL sold approximately 372,000 diesel engines and was consistently ranked No. 1 in unit sales by the China Association of Automobile Manufacturers. Haldex Concentric's water pump for the new YC6K heavy-duty diesel from Yuchai, which combines advanced cooling technology with high strength materials, to enable the engine to meet Euro VI emission requirements.